You are here: Home » Do You Have What it Takes to Unlock The X Door? Do You Have What it Takes to Unlock The X Door? 00:40 . . . 00:39 . . . 00:38 . . .
35:13 . . . 35:12 . . . 35:11 . . . The door closes behind us with an audible click. Somewhere within this room is the key to unlocking the door and gaining our escape. And that is precisely why we are here: to match wits against Daniel and Guillermo Guerrero, co-owners and diabolical creators of The X Door in Valencia, Spain. The objective itself is simple. All you have to do is walk out the same door through which you entered. Unlocking that door, however, is anything but simple. Behind The X Door lies a room decorated with an eclectic collection of vintage items and electronic equipment, all of which may be tools or clues needed to open an array of locked cabinets and chests. Somewhere behind all those locks hides the secret to solving the final puzzle. Some items in the room are riddles. Some hide keys. Others are distractions; time sucking dead ends that conspire with a clock’s relentless march toward zero. Sifting useful clues from mere decorations is just one of the skills you’ll need to defeat The X Door. Time management, organization, attention to detail, teamwork, and above all, problem solving are essential if you hope to beat the Guerrero brothers at their own game. The good news is that you have sixty minutes to make your escape. The bad news is that you’ll need all of those precious minutes to work your way through the game’s elaborate array of nested riddles. But the odds are long. Our team of two mere mortals wasn’t quite up to the task. Sadly our clock ran down before we figured out how to unlock The X Door. Fear not, Daniel saved us from the room if not from our mild embarrassment at having failed in our quest. Given the sheer number and difficulty of puzzles to complete in the game the company discourages two people from playing. We disagree. We may not have won our release, but we had a blast in the attempt. At times during our faux imprisonment we felt like Holmesian geniuses, solving riddles and working clues at a blistering pace. On other occasions when we seemed to run out of options and didn’t know exactly where to turn, the game operator would broadcast a visual clue to help get us back on track. That combination of hard challenges with hints when needed creates an environment where the game difficulty is roughly matched to the ability of the contestants playing. If you’re struggling, and only if you’re struggling, you’ll get some help from on high. Those little nudges keep the game fun and prevent frustration. But for two people the cost is closer to €23 each and that might be a harder nut to swallow for an hour’s entertainment. To be fair, the game is designed and priced for larger groups so couples wanting to play should be aware both of the cost and the challenges. We were honestly on the fence as to whether to do this ourselves when The X Door invited us to review their game. Even at a price of €45 we thought The X Door concept held far more promise for a unique experience than spending €60 for two combined tickets to Valencia’s primary, but more routine, tourist attraction: The City of Arts and Sciences. And now having played The X Door, we’d certainly pay to try their second game before spending more for the city’s science center and aquarium. One way to judge the quality of an experience is how long you talk about it after it’s over. Days later Shannon and I are still discussing the game; what we did wrong, what we did right, and what we’ll do differently when we try again (probably in Barcelona as we left Valencia almost immediately upon being released from The X Door.) So saying that such experiences only offer an hours’ worth of entertainment probably understates things greatly. 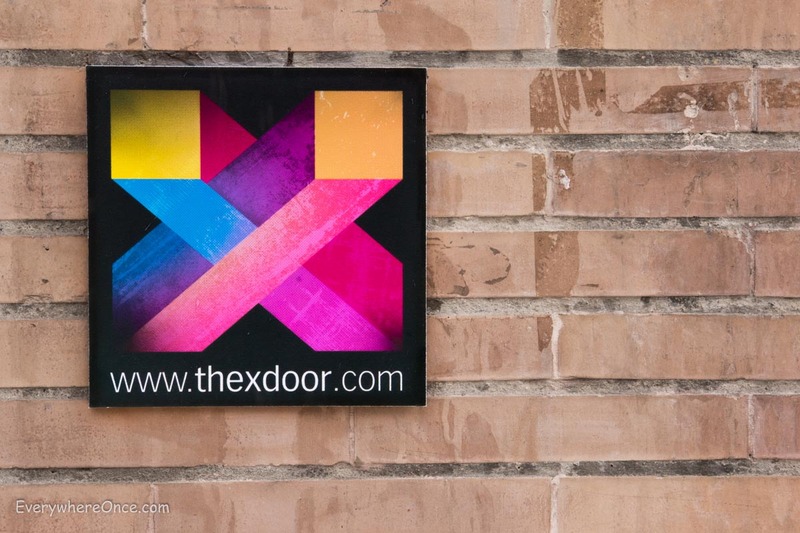 For parties of four and five The X Door is (pardon the pun) a no brainer. Smaller groups on a tight budget may try to reduce the cost by hooking up with other people, perhaps on The X Door’s Facebook page or by checking with other guests at your hotel or hostel. Solving the cipher of optimal group size for your travel budget is just one more worthwhile riddle in the challenge known as The X Door. What a great idea! I’d never heard of anything like this before… Sounds like fun, as long as it’s not too challenging! We hadn’t heard of it before either. I don’t know where it started but there are now two different games in Valencia and one in Barcelona. What a great concept. Maybe one of your readers in the States will take up the challenge to build something like that here! I had the though to do it myself but we’re having too much fun doing what we’re doing. I’m sure it will make its way across the pond soon enough. I hear ya’all even have cat cafes now. LOL. that truly sounds like a great game to play, live and real, outdoors and indoors in a completely unknown city. will keep an eye on it and other places where it’s possible to play. Thanks for sharing the discovery!